Recycling policy is largely decentralized to the state, county and local level, but national messaging still carries weight. Many in the industry have felt a need for more of that in the wake of recent market disruptions, and, while largely symbolic, both the pledge and event are seen as the potential start of a renewed dialogue. The list of pledge signatories and attendees was lengthy — the event itself ran into overflow capacity — but just about every big name in the industry was represented. SWANA was a key organizer and ISRI also had a high-profile seat at the table, in part because of a tandem memorandum of understanding that was signed regarding vehicle mercury switch recovery. Other key industry names included the NWRA, Waste Management, Republic Services, New York's Department of Sanitation, The Recycling Partnership, Closed Loop Partners, Keep America Beautiful, National Recycling Coalition, Sustainable Packaging Coalition, Southeast Recycling Development Council, numerous material-specific associations and many of the nation's largest brands or retailers. 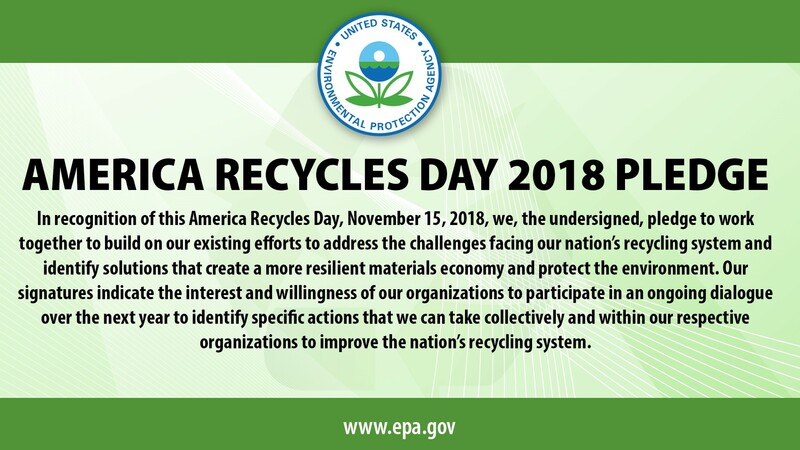 The EPA plans to organize calls and further meetings with these parties on the four action areas soon, with a goal of achieving tangible results in time for another summit on America Recycles Day next year. While each of the areas have been discussed ad nauseam at industry events recently, and the vast majority of what was shared during a two-hour roundtable discussion has been said before, many attendees felt it was important to plug their respective interests in such a high-profile setting. Finding common ground, especially when it comes to financial responsibility, may be challenging in some cases, but the need for ongoing dialogue is clear. The nation's recycling infrastructure will require heightened interest in reform — with regard to both physical assets and policy — if it is to remain viable in the decades to come. As with a recent announcement around food waste, it would appear that emphasizing the economic potential of this opportunity — more than its environmental implications — is the best way to achieve federal buy-in for the foreseeable future.